Cora F. Ulmer age 90 of Asbury, Missouri passed away on Saturday, September 29, 2018 at Mercy Hospital in Joplin. She was born on September 30, 1927 in Waco, Missouri to WM. B. Hurlbert and Clara (Ulmer) Hurlbert. Cora was a past post master in Waco, Missouri and owned and operated Ulmers Grocery Store in Waco. She was married to Henry Ulmer and he preceded her in death on November 10, 2009. 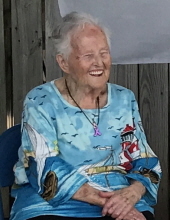 Cora is survived by her son, Thomas Ulmer and wife Nancy of Pittsburg, Kansas; brothers, Cecil Hurlbert of Waco, Gordon Hurlbert of Iowa; sister, Barbara McCorkle of Texas; grandchildren, Jeff Ulmer and wife Tina of Pittsburg, Kansas, Stacy Ulmer of Lamar, Missouri, Jesica Light and husband Josh of Springfield, Missouri; and 5 great grandchildren. Funeral services will be held on Tuesday, October 2, 2018 at 10:00 AM in the chapel of Simpson Funeral Home in Webb City with Reverend Bob Simon officiating. The family will be present for a visitation on Monday from 6:00 PM to 7:00 PM at the funeral home. Burial will follow in Pleasant Hill Cemetery. Services are under the direction of Simpson Funeral Home in Webb City. Visit www.simpsonfh.com for online condolences. To send flowers or a remembrance gift to the family of Cora F. Ulmer, please visit our Tribute Store. "Email Address" would like to share the life celebration of Cora F. Ulmer. Click on the "link" to go to share a favorite memory or leave a condolence message for the family.